Last year's trip to Malta, with its broad range of historical attractions, was a holiday geared towards my interests. This year, we decided on something more to my girlfriend's holiday priorities: plenty of sunshine and a good beach. 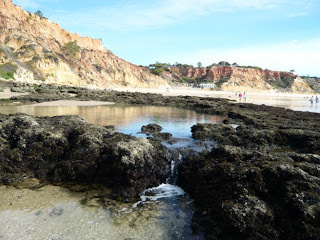 Her choice was Olhos de Agua in Portugal, on the resort-rammed Algarve. October is a little out of season, so fortunately it was less crowded, if still busy. 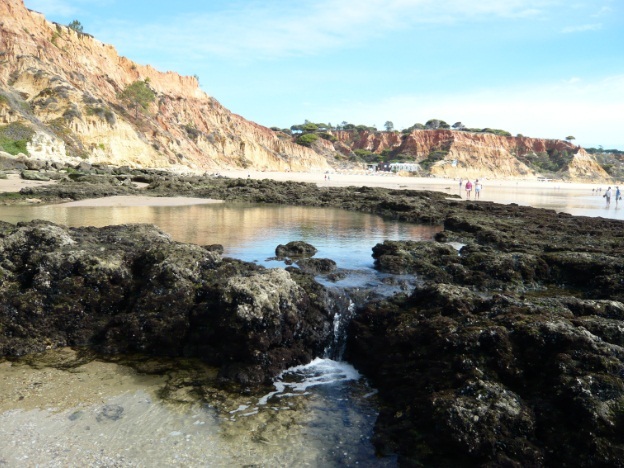 The Hotel Agua Marinha is about a fifteen minute walk from the sandy pleasures of Olhos de Agua, but that also means it is considerably cheaper than staying right by the beach: our package deal worked out at about £12 a night. It is only a two star hotel, but the staff are friendly, the rooms are clean and the service is good. If you're a beach fiend like my gf, then I can recommend Olhos de Agua. The sand is excellent, there are plenty of facilities nearby and you can also opt for shade if you'd like, due to the many rock formations scattered around the shore. There are cliffs surrounding the beach too, along with extensive clumps of stone that appear before noon when the tide is still out. Fans of rockpools should be well pleased, but be careful as you could get stuck once the tide comes back in. In terms of food, near our hotel (which is technically in Torre de Medronheira rather than Olhos de Agua itself) I would suggest eating at Adega do Zé round the corner. Their four course set menus (starter, main, dessert and coffee, though the portions are not huge) are very affordable at €7.50. By the beach, my favourite was Restaurante Tamarillo: you can get a reasonably sized margherita pizza for €5.50, perfect to share between two. At the other end of the scale, avoid the chewy steaks at Restaurante Arraiolos, which again is close to the Agua Marinha. You'll also need to be aware that the bread and olives some eateries provide at the start of a meal are not free, so unless you make a point of declining them they will appear on your bill. Most of the week was spent on the beach either reading or building sand castles. Still, there were two exceptions, when we jumped on the bus to two of the nearby cities. The main bus company appears to be Eva, with trips costing about €5 each way: there is apparently some kind of tourist pass, if you're planning on a lot of journeys. We started off with Albufeira, which doesn't have a huge amount going on besides more beaches, hotels and food (though there were some cool sand sculptures, both in town and on the beach). Note that the last bus back to Olhos de Agua is at 19:30, plus the main bus station is several kilometres out of town. The second trip later in the week was rather more interesting, checking out the Algarve's capital, Faro. This is where you'll probably fly in, but as the guidebook said, it is worth stopping for a look around if you have the time. The bus from Olhos de Agua takes over an hour due to stopping at various random golf clubs, so best to bring a book. If you rent a car or take a taxi, it will take less than half the time. Once you arrive, there are three main attractions to check out. Faro's cathedral costs €3 to enter and encompasses a number of baroque altarpieces, along with a small museum (mostly vestments and a few grizzled reliquaries) and a bell tower. The view from the latter reveals that Faro is surrounded by wetlands, which looked particularly marshy due to the drab weather on the day we visited, but I would assume normally looks suitably idyllic. The Carmelite Church is arguably just as good inside, but a little cheaper at a mere €1. Entry is through a side door which looks distinctly non-churchy, so you may miss it at first. Unusually, the chapel at the back draws upon its surrounding cemetery for building material. 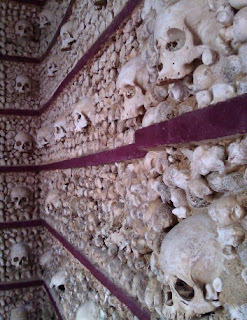 The remains of 1243 monks have been arranged into walls and ceiling, so that lots of carefully spaced skulls surrounded by assorted bones stare down at you from all sides. Being a geek, I was strongly reminded of something similar I saw in a computer game, but I can't remember which one. Possibly The Bard's Tale II? Finally, the Archaeological Museum (now known as the Municipal Museum) is surprisingly extensive given that it only costs €2 to get in. 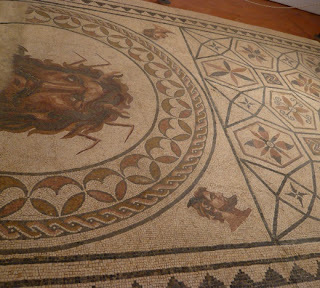 The centrepiece is a mosaic of the sea-god Oceanus, which is quite well-preserved apart from a missing strip just under his chin. There is more Roman material in another room, mainly pillars arranged to show how they would look in situ, along with a few funerary inscriptions. Upstairs I was excited to see that there was a hefty selection of art, starting with a series of paintings from 1962 by Faro native Carlos Felipe Porfirio (1895-1970). 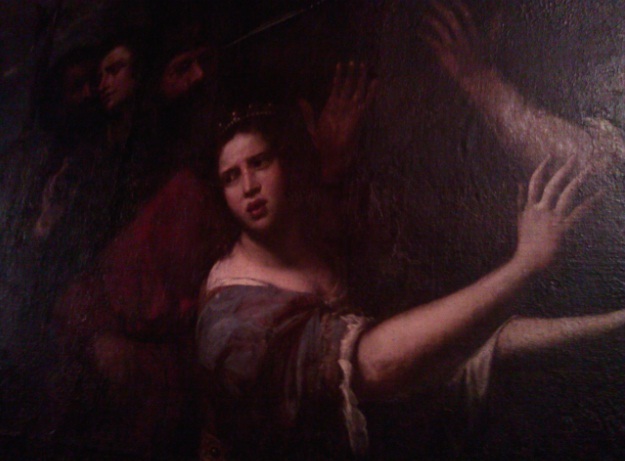 I'm not generally a fan of art past about 1700, with a few exceptions: Porfirio's work is not among them. Still, it was interesting to see something with a local connection. Each painting was based on folktales borne from the Algarve's Moorish past, which seemed to follow a pattern of 'Moorish woman is scorned in some way, supernatural stuff happens as a result'. The next room boasted sixty religious paintings from rather earlier, mostly dating from around the 16th and 17th centuries. There was a heavy Italian influence, with a focus on the depiction of various Catholic saints. Unfortunately, from a visitor perspective the gallery is far too dark, though no doubt that is important for the preservation of the paintings. I am a huge history buff (I majored in history in college), and my favorite part about living in Europe was getting to see all the historical stuff that I had only read about in books. The Carmelite Church looks very interesting and reminds me of the catacombs of Paris. My favorite art is from the Weimar Republic, but I love renaissance stuff as well. Too bad you didn't get to train any BJJ, but it looks like you had a great time regardless. Any favourite artists or particular pieces you can recommend from the Weimar period? I studied the Weimar Republic back during GCSE History, but that's pretty basic. All I know about Weimar art comes from a great BBC 4 program from a while ago about German art in general, simply called The Art of Germany. It's one of the Andrew Graham-Dixon series, who is often the front man for BBC 4's art documentary output. Well worth checking out: my preference was the earlier episodes, unsurprisingly, but the whole series (it's about 4 hours, IIRC) was very good. Okay, thanks. I've never heard of that documentary, and I will check it out. I really dig George Grosz. Max Ernst, Otto Dix, and Christian Schad are all really cool as well. The time period really fascinates me, and it's interesting how the art was a direct result of WWI. I did an independent study in college with my WWI history professor. I got to pick all my own books and paper topics. I got to write really fun papers on the development of the combat airplane and Weimar Republic art. One of the books I chose was called Glitter and Doom. It is out of print (and kind of expensive), but it has some great portraits from the time period. I recommend picking it up. Also, check out the movie Max. Historically, it is a bit inaccurate, but it's a great movie (one of my favorites, actually) and showcases some of the art from the period. Cool, thanks for the suggestions! That book looks awesome, so I'll have to see if I can grab it from a library. Film looks interesting too: having John Cusack in the cast is normally a good sign. 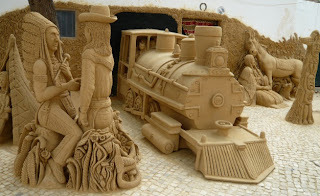 I was in Portugal, too, this summer, but sadly never made it to the Algarve. It looks beautiful. Perhaps in summer it would have been crazy. There are some great Roman remains elsewhere in the country and we had fun poking around them. Those bone-filled chapels are a big deal--we saw one similar in Evora. Really creepy! Interesting that there are several bone chapels: given your husband's profession, did he have a perspective on them? There was an inscription on the doorway that said something like, "We bones wait for yours." This seems like a reminder of mortality, something early Christians liked to do all the time. Even the ancient Romans were more comfortable with this kind of reminder. Denial of death is more a modern concept, perhaps allowed by modern healthcare, distance warfare, old-age homes, and maternity care. Before that, we couldn't put death behind closed doors and so far away from us; it was in our homes and streets. I remember visiting a bone chapel in Rome. Those bones were of Cappuccin friars, though--maybe a different intent? Anyway, very cool place to visit, even though it was creepy! Yeah, that's something I discussed in my thesis: the modern approach to death is very different, partly because of the increasingly secular nature of society (at least here in the UK, though I guess even the religiosity of modern USA is still much less than, say, three or four hundred years ago). In the developed world, as you say, you aren't confronted with death anywhere near as much, so in turn it is arguably a lot more frightening to a 21st Century person than, say, a 16th Century person.